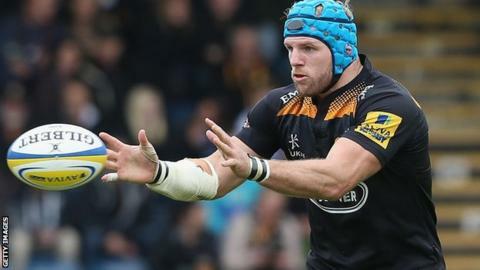 England forward James Haskell says he will be fit to face world champions New Zealand despite a meningitis scare which required hospital treatment. Haskell lost five kilograms in a week after being struck down with a virus at the start of the month. "I've never been so ill in my life," he said. "They thought I had meningitis and put me in an ambulance." Haskell returned to training on Tuesday before the meeting with the All-Blacks on Saturday, 8 November. The 29-year-old says he will be "extremely disappointed" if his recent illness has a bearing on whether he is selected or not. But it is clear that the Wasps skipper, who has been forced to sit out the club's last two matches, has been through a lot in the last few weeks. "They knew it wasn't bacterial meningitis but they thought it might be the viral version because I had all the symptoms of it," he said, reflecting on his spell in London's Charing Cross Hospital. "The big thing for me was not eating. I normally eat five or six times a day but I was struggling to get one or two meals in. I lost about five kilos in a week. "A lot of people around were making a fuss but I actually stayed quite calm. "I'm sure when I'm back in full training mode I will pick the weight up again pretty quickly. I don't foresee it as being an issue."